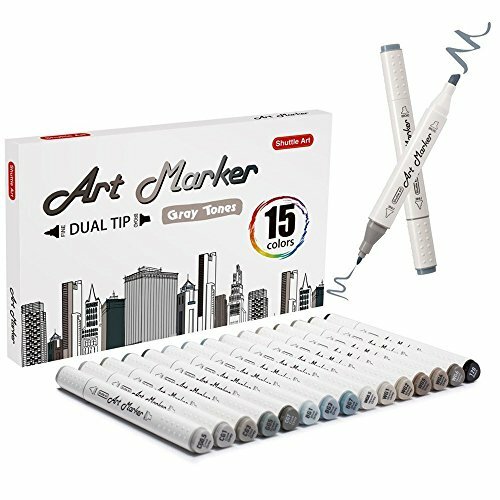 Shuttle Art 15 Pieces Gray Tones Permanent Art Markers provides you with a vast array of gray colors, with no two inks alike making this the perfect for any artistic or hobby project as well as sketching and rendering.There's endless amount uses for gray tones, but some common applications are for capturing details by shading for accents, movement effects and outlining features on sketches like portraits. Each marker cap is individually stamped with an identifying color number which make them perfect for creating a corresponding color chart. Due to the type of ink we use, you may find that these markers will bleed through on certain papers. Don’t worry it’s the characteristic. We do suggest that you always test the markers first and use a heavy card stock behind your artwork or project. Our quick drying and non streaking markers are perfect for blending multiple markers together by using a colorless blender or by layering one color onto another, giving you an unlimited color pallet. Unique ergonomic triangular shaped barrels for an easy and comfortable no slip grip. Unique shape also prevents markers from rolling off smooth surfaces. Stored in an exquisite color box which makes it perfect as a gift. Dual tips: Our markers have both a 7mm broad tip for quick coverage, shadows and a 1mm pointed bullet tip for for highlights, bullet points, and detail works. Gray tones are used for drawing, shading, sketching, designing, outlining, illustrating and rendering.